At this time of year, I like to take at least a few Sunday sermons to contemplate more deeply the Cross of Jesus Christ. This season leading up to Passion Week and finally Resurrection Sunday is a very appropriate time to consider together what our Lord suffered in our place. And several months ago I felt led to study Psalm 22 for this year’s Cross series. Because more than any other Psalm in the Old Testament, Psalm 22 captures the experience of our Lord at His crucifixion. This is the psalm that was on His lips as He bled and died for us and our salvation. That’s the first line of Psalm 22. And it’s not the last one that was fulfilled at the Cross. Isaiah 53 is probably the only passage stronger, more vivid, in the Old Testament to depict the coming suffering of the Messiah. Psalm 22 is either tied with Isaiah 53 or a very close second. Today, I want to do something a little different and little difficult. I want us to go back in time and read Psalm 22 like an Old Testament believer would. Because before Jesus fulfilled this psalm, King David lived it. This is psalm was written by King David, I believe, about his own experience in the first place. We don’t know how that song sounded, but it was probably a sad tune in a minor key. Because the lyrics are incredibly sad. Any song that begins with “My God, my God, why have you forsaken me?” is going to at least start out low and slow. So, what I want to do is to consider this psalm from David’s perspective first, as the author and first singer. And then next time, we’ll consider it more closely from Jesus’ perspective as the ultimate singer of Psalm 22. Next time, we’ll turn to Matthew 27 and see how this song played out in the crucifixion of our Lord. But this time, I want us to see it as a template for our own prayers during times when we feel abandoned and alone. Like David did. It’s almost impossible for a Christian to not hear Jesus and not see Jesus in every line of this song. And that’s right! Because He is. This is a prophetic psalm. Few are more prophetic! But I think that it was first off about how David felt before it was about how Jesus felt. There are a lot of things like that in the Old Testament, aren’t there? The Old Testament is full of shadows. But Christ is the substance. The Old Testament is full of lesser things. And Christ is the greater. 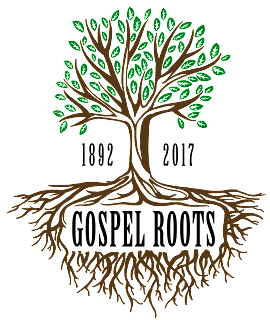 The Old Testament is full of figures and metaphors and types and analogies. And Christ is the Big Reality that all of those smaller things were pointing towards. So it is with this psalm. You and I don’t like to talk like this psalm does. We don’t like to use words like these to talk to God. One reason for that is that we don’t like to feel bad. And these words are all about feeling bad! We’d all rather sing Psalm 23 than the psalm that comes before it. Psalm 23 is so comforting, and Psalm 22 is so not. Because there are times when we need to lament. We need biblical language of lament for those times when we are experiencing suffering. I’m so glad that our God has given us language like this to use to express our true feelings. Because there are times when you need to pull out songs like Psalm 22. If you have never felt like Psalm 22, just wait. You haven’t lived long enough. Psalm 22 is for times of trouble when it feels like God is far far away. And you feel awful and alone. When you feel like that, you need words to pray. You need a pattern to pray. And it’s as good as Psalm 23 is, it’s not enough. If it was enough then God would have skipped 22 and gone right to 23. God is greater than that and wiser. He gave us all of the Psalms to learn how to talk to God. #1. TALK TO YOUR GOD WHEN YOU FEEL FORSAKEN. I think that’s really big. Because you won’t necessarily feel like it. You will feel alone and you won’t feel like talking to God. But these psalms of lament like Psalm 22 show us what a believer does when he or she is hurting badly. They take that pain to their Lord. Whenever I read verse 1, I almost miss one of the most important words in verse 1. And those are important words. But what word do I often miss? 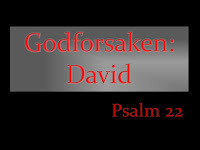 David doesn’t stop relating to God just because he’s bewildered and confused and in pain. He goes to God with his bewilderment, confusion, and pain! He takes his agony and anguish directly to His God. Let’s read. Are there more painful words? That word “groaning” in verse 1 is the same word as “roaring” in verse 13. He is hurting so bad that it’s like a primal yell. 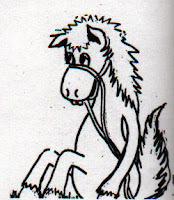 He feels abandoned and alone and in pain and ... forsaken. Like God is no longer answering His calls. “I call you day and night, but you keep swiping left. I think my number is blocked. I think you’ve unfriended me. All I get is blank wall. My prayers go nowhere. They hit the ceiling and bounce back! You see Jesus in there, don’t you? I do, too. We don’t know exactly when in David’s life he felt like this. Remember when we studied David’s life a few years ago? In first and second Samuel? David was constantly on the run, a fugitive. And people were out to get him. And sometimes he was in shame. Here, he didn’t just feel forsaken by God but by men, as well. Maybe it was one of those times when he was sick and everybody thought he was about to die. And his enemies were gloating over him. All of his life, Yahweh has been David’s God. “But I just don’t understand. That’s not how it seems now. See, he’s asking God to change it. He hasn’t given up on God. Even when he doesn’t understand Him. And he pleads for God to come near because that’s where the trouble is. Do you need to pray verse 11 right now in your life? It doesn’t say what the trouble is. We know what was for Jesus, but we don’t know what it was for David, so we can fill in our own blank there for us. Maybe it’s sickness, cancer, heart-disease, arthritis, m-s.
Maybe it’s grief and the death of a loved-one. Maybe it’s a conflict, a break-up, a divorce. Maybe it’s abuse. Maybe it’s trauma. Maybe it’s just plain old loneliness or unanswered prayer. You feel scared, alone, abandoned, afraid, ashamed. Don’t run away from God with those feelings. Take them straight to Him and don’t stop. But you don’t have to pretend that’s it’s all hunky-dory. You don’t to have grin and bear it and fake it until you make it. Run to the God of Psalm 23, yes. But run to the God of Psalm 22, as well. He’s the same one! Lament. Talk to God when you feel forsaken. This is figurative language. It’s possible that he’s actually being attacked by bulls and lions, but I doubt that here. I think these are bad guys who want to take David down. And this is the way they make him feel. I remember the night before my big surgery, being scared. And I called Heather and laid out my fears about what might happen when I was on the table. I know. I see Jesus there, too. We’ll glory in that next time. How perfectly He filled up these words. But you see how David felt back then? Like he was surrounded and trapped and wounded. Like dogs had bit into his hands and feet. What Marilynn experienced last Summer. And it seems from this wording that his enemies expect David to die so that they will walk away with the clothes off of his back. He feels like Jew in a concentration camp. Just a bag of bones. “Undo all of this, Lord! The dogs, the lions, the bulls of Bashan, the wild oxen. We need to learn to talk like that to God. It’s not the only way that we talk to God, but it is a good way, a wise way, an authorized way. A Jesus way. Now, the psalm turns a major corner between verse 21 and verse 22. And that’s a very possible translation of the Hebrew. But I tend to think NIV is right that David just anticipates that answer. And that he just expects God to show up and deliver him as requested. He hasn’t actually seen that deliverance yet, but he believes that it’s on the way. And so point #2. He plans to praise Him. “I will declare your name to my brothers; in the congregation I will praise you. You who fear the LORD, praise him! All you descendants of Jacob, honor him! Revere him, all you descendants of Israel! Sounds different all of a sudden, doesn’t it? I wonder if “The Doe of the Morning” transposes into a major key at this point and becomes a faster song or a bold anthem instead of a sad ballad. David, in faith, expects God to answer his prayers. He expects God to save him. He declares what he knows (even if he doesn’t feel it yet) that God has not despised or disdained or scorned or ignored him in his afflictions. No matter how it feels, God has not hidden his face from David, but has listened to his cry for help. This is not pretending that all is well. This is not faking it. This is believing the good news after singing how bad things feel. This is taking heart because Jesus has overcome the world even though in this world you will have trouble. David plans to praise God some day soon because He believes in God’s promises. Even the ones that he cannot yet feel. David goes big there at the end, doesn’t he? David expects God to win his present case and in every case and to be worthy of all of our praise. All of the praise of the world forever and ever. David believes that God will solve every problem and right every wrong. And answer every prayer of His people. And we’re back to Jesus, aren’t we? You can’t get away from Him in this Psalm. Did Jesus expect to praise God in this way? Did Jesus expect God to answer His prayer. But the answer, the vindication, the accomplishment, was on the other side of His death. He didn’t get a last second reprieve like David did here. He had to actually go through death to get to see this glory. It was for the joy set before Him that He endured the Cross, despising its shame. But He fully expected God to answer His prayer and planned in advance to thank Him before the whole world when He did. You and I need to do that, too. Whatever you’re going through right now, talk to God to about it. Take Him your whole self including all of your true feelings, no matter how ragged they are. He wants all of you, just as you are. Bring Him the whole blistering mess. And, also, in decide in advance to bring Him big praise when He gets you through it to the other side. Tell God that you plan to tell everyone and their brother’s bestfriend’s cousin’s dog what the Lord has done. 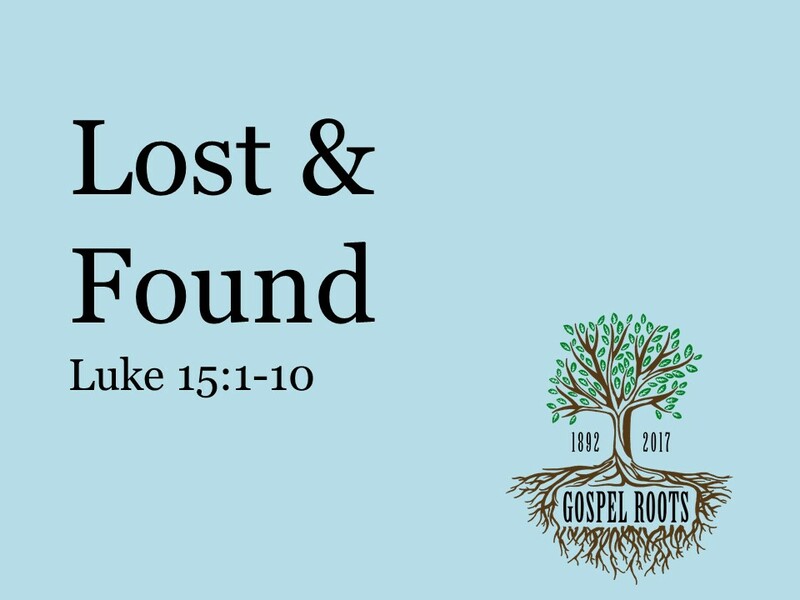 [Matt's Messages] "Lost and Found"
This is our third message in our ongoing “Gospel Roots” sermon series where we revisit and recommit to some of our foundational values that have shaped and defined us as a church family through the years. The second message was about something we’ve done every week together for the last 125 years–we’ve sung together. We sing the gospel. We don’t just say it, we sing it, to God in thanksgiving and to each other to remind ourselves of Jesus of Christ and His Crucified. In today’s message, I want to talk about sharing that gospel. Not just savoring it or singing about it, but actually sharing the gospel with other people, lost people. Our church has a long and rich history of evangelism. I like to point out that it’s our middle name! That word “evangelical” is such a tongue-twister for people isn’t it? I love it when people call on the phone, and they don’t know that E-word. And historically, it has been. We care about lost people and we strive to share the gospel with them. Let me show you how this has played out in the past. In the 1970's this little fleet of blue buses went up and down these hills and hollers picking up folks, especially children to bring them here to hear the gospel. That was before my time, but I love that we had them. This was one during my time. Anybody remember this guy? These were the hats we bought. And the Lord gave us over 1,200 people to visit our campus that day. Nobody came on our campus that day and left without hearing the good news about Jesus Christ. And it’s not just about getting people onto our campus. In 2002, we participated heavily in the JESUS video project. 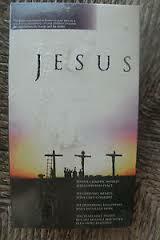 We were part of a coalition of churches that mailed a VHS copy of the Jesus video to every single home in our county. Over 30,000 videos went into the mail. This is artifact. I’m going to ask Lita if she would put this in the display case out there. With the old song books and the old communion ware. The VHS tape! Whatever that is. Nowadays, you can stream that sort of thing over your phone. But back then, it was a major undertaking to get this into everybody’s hands. And we threw ourselves into that. Because we loved lost people and wanted them to have what we have, the gospel of Jesus Christ and Him Crucified. When we built the Ark Park out here, we called it, “An Evangelistic Playground.” Because we didn’t build it just for us. We built it for our community. Because we love them and because we wanted a place where folks would come, and we could talk to them about Jesus. That’s supposed to be a gospel playground out there. I love how this church has historically thrown itself into evangelism. We are not just focused inward on ourselves. On our worship, on our fellowship, on our own stuff. This church has always had a heart for lost people and a commitment to do whatever it takes to reach them. And in that, this church has reflected the very heart of God. Luke chapter 15 is about the heart of God. What God cares about. And how strongly God cares about the lost. Luke 15 is one of the most famous and familiar chapters in the whole Bible because it contains 3 of Jesus’ most famous parables. I wish I had time to give you all three, but we’re only going to look at the first two today. The third one is the one that you know the best, so you can read this afternoon. And all of this is to show us how the Lord cares about the lost. The lost sheep, the lost coin, and (if you read on) the lost son. And it’s easy to overlook them. I have just skimmed past them many times on my way to good stuff–the stories. The tax collectors were basically the legalized thieves of the Roman world. They were turncoat Jews who were empowered by the Romans to not only take the legal taxes for the government, but to take as much more as they could get away with from every taxpayer. But catch this–they were the ones attracted to Jesus. They were all (v.1) “gathering around the hear him.” And more than that, Jesus was attracted to them. Something becomes lost. What is it? It’s a sheep. Remember to whom Jesus is talking. More rejoicing than if a so-called white hat guy doesn’t ever go anywhere. But, just in case they didn’t get it, Jesus tells another story. A very similar one. In Greek, it’s a drachma, about a day’s wages. So someone conducts a desperate search! A couple of weeks ago, Heather lost something at home, and we turned the house upside down looking for it. I remember once, one of my little nephews lost a tiny little toy he had just bought with his own money at a playground. Could we have found that toy if we tried hard enough? But if we had been desperate enough, like this woman, if we had really cared about it, we could have searched until it was found. She goes to great lengths to find it. If the kingdom of God is a party (and that’s one of the things Jesus says it is! ), then the theme of that party is joy in repentant sinners. Because that’s the heart of God! 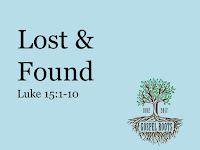 Now you can see that pattern repeated again in the parable of the lost son (or lost sons) read it this afternoon and track how it’s like these other two parables and how it has a few more twists that really bring it home. But we’re going stop with just these 2 stories today and apply them to our church and our lives today. We’re going to put ourselves into these stories. Turn from your sin and put your trust in the Savior. Repent. You might see yourself as a pretty good guy or a pretty good gal. Or maybe it was far away from here and unrelated. But if it hasn’t happened yet, it’s past time. And by this, I mean, join the search party for lost people. Let me give you three steps here. First we have to care. We have to cultivate a love for those people whom God loves. This church has been really good at that for 125 years. And I am so proud of our church family when I see it. 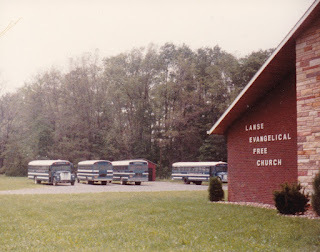 I love to tell the story about my first Summer here as your pastor. I was writing the sermons on Saturday nights (which I still often do! ), and there were gangs of young people out here on the parking lot on Saturday nights. Before we had a nice paved parking lot. This was the meeting spot. They’d be out here doing donuts in the field. Smoking, talking, hanging out. And I told the elder board about that. It was Wally and George and Blair and Bruce and Charlie and those guys. And I told them about what was going on in our parking lot, and asked if we needed to have the police drop. I knew then that this church was a keeper. Who have you cared enough about to invite to the Wild Game Dinner? I promise you that Zeke Pipher will make the gospel clear to them. But people don’t care what you know until they know that you care. Does somebody know that you care about them and are going to bring them to hear Zeke on Saturday? Our Louisiana Team is down South this week serving in the name of Jesus Christ, showing those folks down there that we care. I’m proud of you for sending them. I’m proud of them for going. We’ve got to keep the gospel as our middle name. The second step is prayer. We have to continue to pray for the lost to be found. Remember this artifact from our history? Back in 2007, we filled up this fishbowl with the names of people for whom we are praying to come to know Jesus. And we fasted and prayed over those names. And some of those names are names of people who are today trusting Jesus Christ as their Savior, in part because we prayed! Who are you praying for right now to get found? Who are you praying for to come to the Wild Game Dinner? Or to come to church next Sunday and hear Zeke preach here? Or come on Resurrection Sunday and hear the gospel? That’s what our Harvest Prayer Time is all about. And the third step is to share. It’s not enough to just want them to know Jesus, we have to introduce them to Jesus. It takes words. It takes the gospel. If we truly care, we will dare to share. The Holy Spirit will give us the power. Our friend Matt Modzel just recently shared with a group of teenagers at the FCA Badminton Tournament last Friday night. He didn’t know I was taking his picture. And he doesn’t know that I’m going to put it here today. But I’m proud of him. Because he overcame his nervousness and got up on his hind legs and shared his testimony and the good news about how God so loved the world. When Matt’s nervous his face goes all red. It was as red as those mats against the wall there. But that didn’t stop him for sharing. We need to join the search and rescue recovery team. And that requires faith and boldness. I don’t want to be like the so-called “white hat” people in this story. If I have to choose sides, then put me with the black hats. Because that’s where Jesus is. Let me say something about our culture right now and what Christians need to be doing in it. I hear a lot of talk about the two M’s–Muslims and Mexicans. Those two kinds of people are in the news a lot. And I hear a lot of people being very negative about both of them. Very against Muslims and Mexicans. It’s like they are the black hats or something. And I understand that there are legitimate questions for our leaders to sort out in terms of immigration and national security. We need good people to come up with good policies and practices on those. But I what I am concerned about is how much muttering I hear, even among Christians. I hear hate and fear and anger. How can we reach Muslims with the gospel of Jesus Christ? Those that are coming here, and how can we go to them? How can we reach immigrants (with or without the proper documents!) with the hope of salvation in Jesus Christ? And he cares. He desperately cares. He’s turning the house upside down to find them. Jesus says what God cares about the most is not our national security or our economy or jobs for Americans or even the rule of law. What God cares about most is finding lost people. He’s after the black hats. Are we a part of God’s desperate search party? Who do we need to pray for the next 7 days and then to bring up Jesus in conversation? That’s what this church is all about. Let’s pretend that we’re the friends in these two stories. My prayer is that we, as a church, will see a greater harvest and have a greater party in the next few months and years than we ever have before. But the gospel has to stay our middle name. We can’t lose sight of this driving value of our church to reach out to the lost with the good news of Jesus Christ. I'm going to miss these guys. They were my constant companions for the last year as we studied the Books of Kings in the Old Testament. 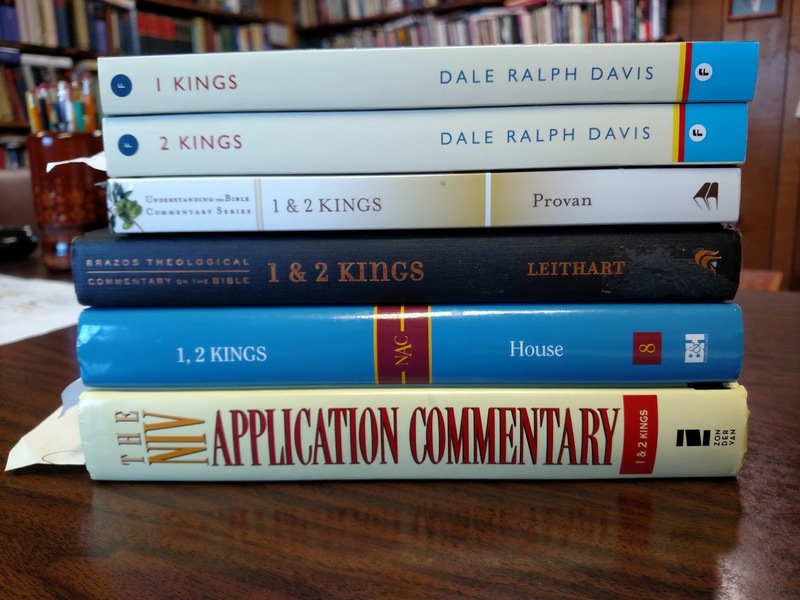 Dale Ralph Davis, 1 Kings: The Wisdom and the Folly & 2 Kings: The Power and the Fury. 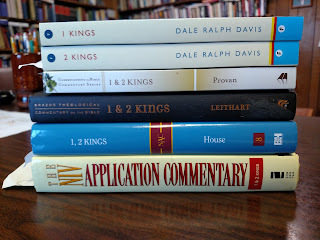 Dale Davis writes my favorite commentaries for help in preaching Old Testament narrative books. He is an bona fide OT scholar and it shows, but his commentaries are edited versions of his sermons on through these books, so they are pastoral and practical, as well. Provan is a master of concision and always sees something that the other commentators miss. His book forms the basis for the notes in the ESV Study Bible. Leithart is good for opening up maximal possibilities. I don't pick up everything he lays down, but he makes fascinating connections between various themes, words, characters, and other items across the testaments. If I was only allowed one commentary on 1-2 Kings, I would probably buy this one because House does it all in solid workmanlike prose. He's not as fun to read as Davis, but he really gets the job done. I always checked everything I planned to say on Sundays against the discussion in this book. I've had Konkel's commentary the longest of the set. I used it to teach the youth boys' class the books of kings a few years ago, and it served me well. As with others in this series, there is a major emphasis in each section on application to life. 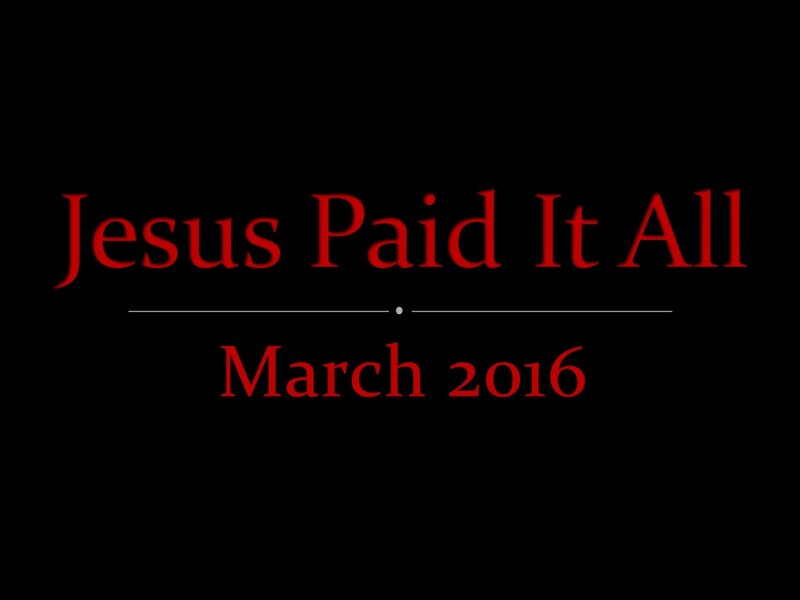 All four messages from the short series on the finished work of Christ back in March of 2016. 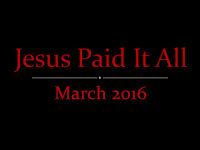 All 30 messages in this sermon series that ran from April 3, 2016 to March 5, 2017. 29. "I Have Found the Book of the Law"
[Matt's Messages] "The Table of the King"
We’ve been in the Books of Kings now for 30 messages. On and off now for 11 months from the beginning of April 2016 to the beginning of March 2017. And all of that time, the Books of Kings have been particularly repetitive. There is a broken record playing throughout the Books of Kings and the song is not, for the most part, a happy one. This book is, after all, a tragedy. Today, we’re going to read the ending, and it is NOT a happy one. In fact, I think it would be easy to argue that these chapters chronicle the saddest event in Israel’s history between the Fall of Genesis 3 and the trial of Jesus Christ. These are the worst days of the nation of Israel in the Old Testament. These are the days when the southern kingdom, called Judah, went into exile, “went into captivity away from her land” (2 Kings 25:21). This tragic day has been coming for a very long time. If you think about it, ever since Abraham was given the promises of offspring, land, and blessing, the story of Israel was on the rise. In 2003, we began studying that Big Story of the Old Testament. And in Genesis, we saw the promises be fulfilled slowly but surely. 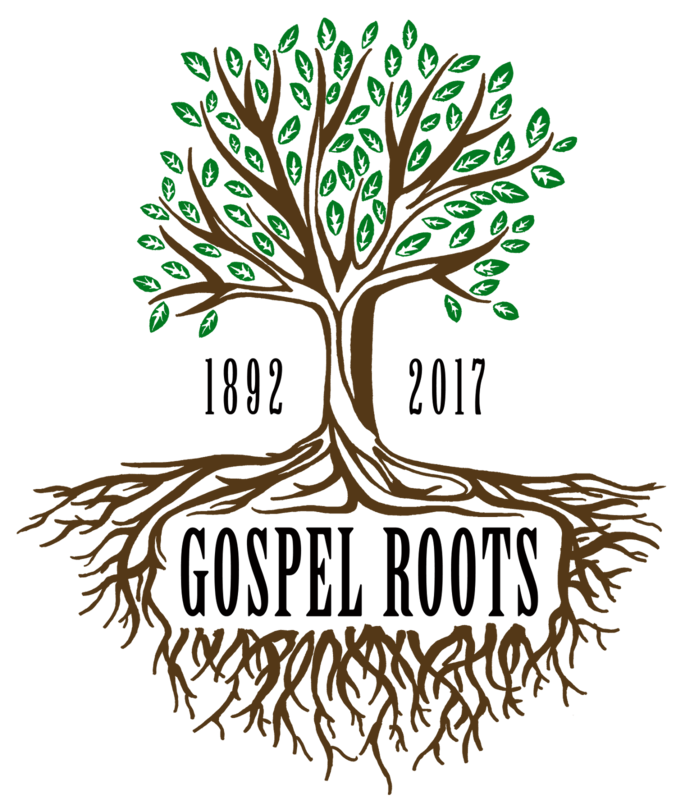 In Exodus, the people grew and grew. And the LORD blessed them. And then in Numbers, they marched to the Promised Land. And God promised them that if they obeyed the Law, if they were a thumbs-up people, He would continue to bless them. And they would possess the Land. And then in Joshua they actually began to possess the land. But then the downward spiral began. The book of Judges. There were bright spots along the way like Ruth and Boaz and even Samuel. But they were never quite what they ought to be. And the threat of exile began to gather like storm clouds on the horizon. God gave them a king after His own heart in David. And then David’s son was given wisdom and a glorious golden kingdom. That was the highpoint of the fulfillment of all of the promises so far. But then it began to unravel. The kingdom was torn in two. Everything we’ve read now for the last year. And the two kingdoms went up and down. The northern kingdom much faster than the southern kingdom. But both of them failing to keep the covenant. Always, God has a remnant. He’s always at work caring for His people. We saw that in Elijah and Elisha and every thumbs-up king. But the slide has been ever downward. And now we’ve reached the bottom. Last week, we read about one of those bright spots along the way. Godly King Josiah who led a biblical reformation in Judah. But even his biblical godliness was not enough to stem the tide of what was to come. And now he’s dead, and his son Jehoahaz has become king. In less than 25 years from Josiah’s death, Judah will have run through 4 bad kings, and the whole nation will be destroyed. This is that sad story. 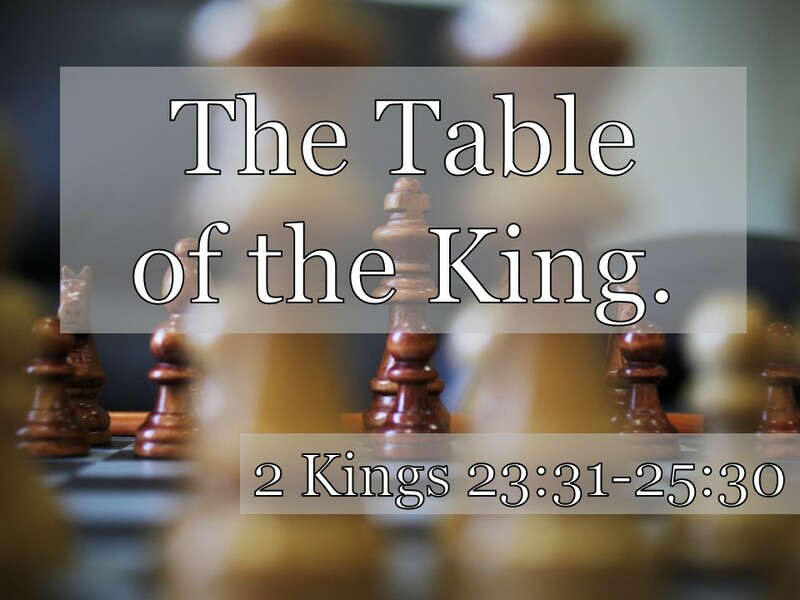 The title of today’s message is “The Table of the King,” but I’m not going to explain it until the very end. Hang with me, and I’ll explain it when we get there. I don’t think you’ll be surprised by what we learn today of what we can apply to our lives. I have four headings that I want to tell this story under and they should all be very familiar for those who have tracked with me throughout this sermon series. They are all things we’ve talked about again and again and again throughout the Books of Kings. #1. THE EYES OF THE LORD. What matters most is in any given situation is God’s evaluation of it. We’ve seen this phrase again and again. “The eyes of the LORD.” It appears here in verse 32. Let’s start in verse 31. 2 Kings 23:31. How many times have we asked the question, “Thumbs up or thumbs down?” over the last year? Like a broken record! Unfortunately, the rest of these kings of Judah are all thumbs-down. No more good ones. This one only makes it 3 months. And why is he thumbs-down? It’s not because he wasn’t smart. It’s not because he wasn’t politically savvy. It’s not because he didn’t have good ideas about how to run a big organization. It’s not because he lacked royal skills. That’s why he’s thumbs down. His great-grandpa Manasseh ruled for 55 years. He must have been pretty good at the king thing. But he was thumbs-down, too. Because he didn’t do his one job in the eyes of the LORD. He had just one job, and he didn’t do it. It’s what God thinks about you or me or about anything that is the most important thing. It doesn’t matter what our friends think. It doesn’t matter what our co-workers think. It doesn’t matter what our family thinks. It doesn’t even really matter what we think. Like it matters what God thinks! What really matters in life is how things stand in the eyes of the LORD. If we truly get that, we will live very differently. Amen? What if all you cared about ultimately was the Lord’s opinion? And you lived for Him and Him alone? That’s how Jesus lived. He wasn’t controlled by anything but bringing glory to His Father whom He loved. Remember, when these kings are at their best, they remind us of King Jesus. But not Jehoahaz. He did evil in the eyes of the LORD, just as his fathers had done. Not his daddy. King Josiah had been two thumbs-up. 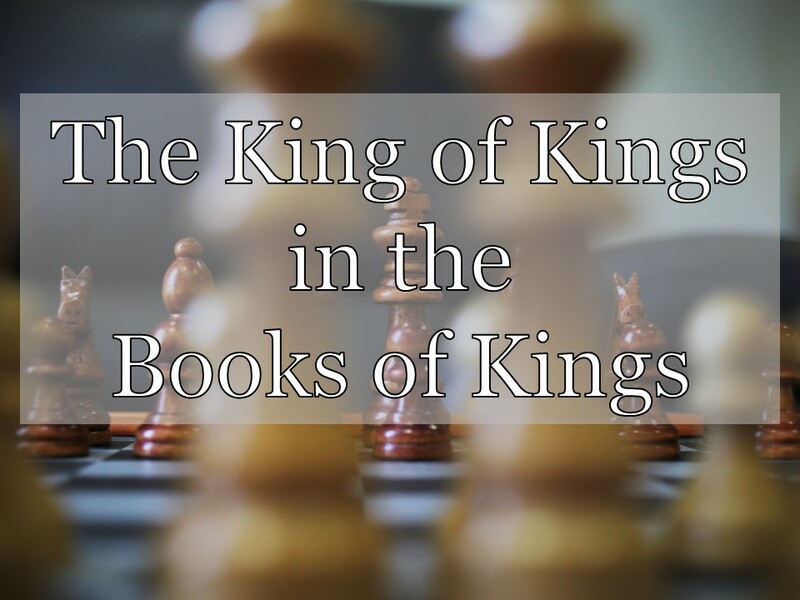 Here’s where it’s gotten to–the king of Egypt is deciding who will be the king of Judah! Jehoahaz is out, and his brother renamed Jehoiakim is in. And he’s a real stinker. If you want to know how bad Jehoiakim was, then read the book of Jeremiah. Jeremiah is prophesying during this time period. Jehoiakim is living under Neco’s thumb and levies a great big tax on the people, but he still finds enough money in the budget to build a big palace for himself. And he kills prophets. And he tears up the word of God and burns it in a fire to keep himself warm. Now, here’s the second thing we’re going to see. I’d be willing to bet that some of you could nail if I gave you a second. #2. THE WORD OF THE LORD. God has promised some things. God has said some things. And those things will happen. For certain. You can count on it. This is just what God had said. God has promised that Judah will be destroyed, and He will see to it that it happens just as he said. By the way, this is when Daniel and his friends get taken into captivity in Babylon. Taken into captivity during the failed reign of King Jehoiakim. But it wasn’t because Nebuchadnezzar was so powerful. They had reached the limit of God’s longsuffering patience. And He had to keep His promises. All of those things that God said He would do in Deuteronomy, if the nation forsook Him and broke the covenant? He had to do those things or He wouldn’t have been faithful to His end of the covenant! See, we should be glad that God keeps His threats, because it’s another proof that God is faithful to keep His promises. One of the biggest themes that runs through the whole Old Testament, we’ve seen it again and again, is that God always keeps His promises. And if He never carried out His threats, it would bring His faithfulness into dubiety. By the way, that’s called the “Battle of Carchemish.” You might have heard about it in your world history classes. It was kind of a big deal. “Jehoiachin was eighteen years old when he became king, and he reigned in Jerusalem three months. His mother's name was Nehushta daughter of Elnathan; she was from Jerusalem. He did evil in the eyes of the LORD, just as his father had done. At that time the officers of Nebuchadnezzar king of Babylon advanced on Jerusalem and laid siege to it, and Nebuchadnezzar himself came up to the city while his officers were besieging it. By the way, this is when the prophet Ezekiel was taken into captivity himself. He begins his ministry in the fifth year of Jehoiachin’s exile (Ez. 1:2). You see how all of the Bible is coming together and fits together? 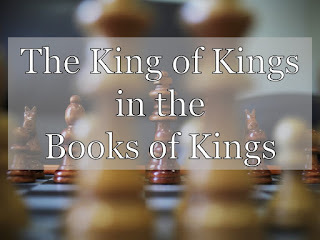 “As the LORD had declared [it’s because of the word of the LORD], Nebuchadnezzar removed all the treasures from the temple of the LORD and from the royal palace, and took away all the gold articles that Solomon king of Israel had made for the temple of the LORD. He carried into exile all Jerusalem: all the officers and fighting men, and all the craftsmen and artisans–a total of ten thousand. Only the poorest people of the land were left. #3. THE ANGER OF THE LORD. All of this did not happen because Babylon was so great. It happened because God was so angry. Righteously, justly, perfectly, virtuously angry. We have trouble with that because our anger goes so wrong so often. We’re not that familiar with righteous anger. But God does anger perfectly. And this was His perfect righteous anger at work. Now, you need to know that Zedekiah was a wimpy king. He was one of those put a finger to the wind to decide what to do kind of guys. He was evil like Jehoiakim or Manasseh, but he was evil because he just did what he thought was politically expedient, not what was righteous. That sounds good! But if you read the book of Jeremiah, you find out that that’s the exact opposite of what God had told Zedekiah to do through the prophet. God had told them to submit to Babylon, so of course, Zedekiah does the opposite! And now the flood of judgment comes. Because of the anger of the LORD. Chapter 25. By the ninth day of the fourth month the famine in the city had become so severe that there was no food for the people to eat. Then the city wall was broken through, and the whole army fled at night through the gate between the two walls near the king's garden, though the Babylonians were surrounding the city. They fled toward the Arabah, but the Babylonian army pursued the king and overtook him in the plains of Jericho. All his soldiers were separated from him and scattered, and he was captured. He was taken to the king of Babylon at Riblah, where sentence was pronounced on him. Remember when they built that temple? And all that it stood for? The very presence of God? They are being thrust out of His presence. “The whole Babylonian army, under the commander of the imperial guard, broke down the walls around Jerusalem. Nebuzaradan the commander of the guard carried into exile the people who remained in the city, along with the rest of the populace and those who had gone over to the king of Babylon. But the commander left behind some of the poorest people of the land to work the vineyards and fields. The Babylonians broke up the bronze pillars, the movable stands and the bronze Sea that were at the temple of the LORD and they carried the bronze to Babylon. They also took away the pots, shovels, wick trimmers, dishes and all the bronze articles used in the temple service. The commander of the imperial guard took away the censers and sprinkling bowls–all that were made of pure gold or silver. Remember when they built that? The gold, the silver, the bronze. It’s all gone. It’s all undone. You feel like there should be some judgment to come on Babylon for this. That is one of the saddest sentences in the whole Old Testament. This afternoon, you should read the book of Lamentations to see how Israel felt at this very moment. There’s a whole book in your Bible just to record how sad they were about this event. We are missing what God has to say to us if we don’t feel some of the sorrow of this tragic moment. The worst thing ever has happened. God has, in His righteous anger, destroyed the temple, destroyed Jerusalem, and sent Judah into exile. If you want to know more about this, read the last few chapters of Jeremiah and all of Lamentations. Because you really feel just how terrible these events truly are. But we’ve got one more. And it’s just a little glimmer of light, but on a dark day, a little glimmer shines bright. #4. THE GRACE OF THE LORD. Look at verse 27. One the one hand, it’s a table of dishonor and defeat. Jehoiachin is in exile and has no power or authority in Judah. He lives off of the king of Babylon’s table. But I also think there is ray of hope here, too. Because of how he’s treated. This guy has been in exile for 37 years and living as a prisoner. It’s weird to think about it, but Daniel is at work in this kingdom as an official this whole time. And his king is in prison this whole time. And until 37 years after he was sent into exile, he is called up, given new clothes and treated, kind of royally. He’s a Son of David who is treated as the rightful king. I think there’s some grace here. I don’t think you’re supposed to get all excited about it. Because the main thing we should be feeling at the end of 2 Kings is sadness and sorrow and lamentation. But seeing this old king, this thumbs-down king, being given a seat of honor and provision at this king’s table, makes me think that God is still at work. God is still keeping His promises, including the promise of Davidic King. God is still being kind and gentle and not giving everything that His wayward people deserve. God is still showing mercy and kindness and steadfast love. Do you see that there? It also reminds me of a much greater King and His table. The table that we are going to eat at right now. Because when these kings have been at their best, they have reminded us of Jesus. But when they have been at their worst (and they have been at their worst! ), they remind us of why we need Jesus. It’s because of the eyes of the LORD that we need Jesus. We have been evaluated and found wanting. It’s because of the word of the LORD that we need Jesus. God has promised to punish sin. It’s because of the anger of the LORD that we need Jesus. Because “the wrath of God is being revealed from heaven against all the godlessness and wickedness of men who suppress the truth by their wickedness...” (Romans 1:18). What happened to the temple and to Jerusalem is a shadow, a picture, of the judgment to come. The anger of God poured out on the disobedient. And that’s why He came. This Table represents the Cross. Where the King of Glory took on our sin. He was forsaken. He was condemned. Jesus absorbed the righteous wrath of God. And He turned the ultimate tragedy into an ultimate victory. For all who will put their faith in Him. This is the Table of the King of Kings. 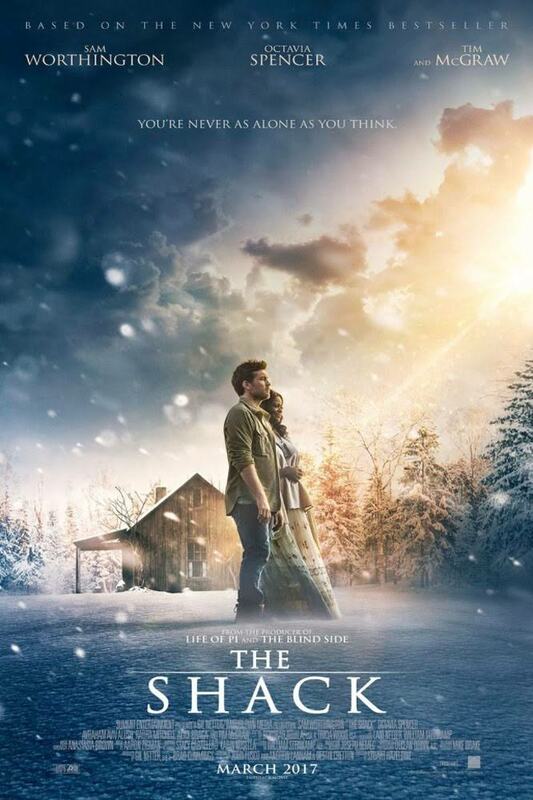 "The Shack" movie comes out this weekend, an adaptation of the uber-popular book The Shack by William P. Young. A whole lot of people are talking about it online right now. I read the book in 2009 and registered my cautions and concerns about it then, and today, as none of my concerns have gone away, my cautions also remain. Set your discernment-level to "high" if you chose to watch this one. Anyone who is strongly influenced by the imaginative world of The Shack will be totally unprepared for the far more multi-dimensional and complex God that you actually meet when you read the Bible. . . . The God of The Shack has none of the balance and complexity of the Biblical God. Half a God is not God at all. Tim also has written recently on his concerns about watching any movie where God is portrayed in human form, especially God the Father and God the Spirit. While I don't share his concerns in the same way, I thought his follow-up article about the differences between Aslan of Narnia and "Papa" of The Shack had a lot of merit to it. 3. Author Randy Alcorn, who also writes fiction to teach theology and has met with the author, urges discernment about watching the movie (and previously wrote about concerns about the book's content). 4. Plugged In and World Magazine both posted reviews which try to provide balancing opinions. In its typical skewering satirical fashion, The Babylon Bee was a little less balanced. 5. David Mathis of Desiring God compares and contrasts The Shack with the biblical book of Job. I think this is a wonderful comparison to make because the book is not primarily about the Trinity (though it is definitely teaching a poor theology proper, too) so much as it is about suffering. I'm with Mathis in finding the Book of Job's answer much more satisfying than Young's, even if it does not conform to my wishes. Said it was good as Bunyan. He must have meant Paul. Where we keep our crap. ‘Cuz she is so sweet. All of that to say, read and watch with discernment. And if you don't know how to do that, give this book and its movie a pass. There's a lot better stuff out there for you to ingest.